Money Talks – What Is It Saying To You? Have you ever thought about how the messages you heard growing up about money affect how you relate to it now? When I work with a client on increasing their income or increasing their sales, it’s a must explore topic. We usually don’t realize the significance of what we witnessed about how money was dealt with in our home growing up. My client Curt (a name we’ll use right now for the purpose of this blog), had not increased his income in about eight years. His initial answer was, “We didn’t talk about rich people. What I do remember hearing about money was that if there is work, the money will come.” Well that would make sense to most people right now, since most people think they won’t receive money unless we are working for it. So I went on to ask him questions such as “what number equals rich for you?” I also asked him if his brain perceived it as possible for him to be rich. That question received a response with a casual saying that sounds like a logical philosophy. Here was the revealing significant philosophy that he was holding on to: “For me to be rich would be like winning the lottery or as if I could be taller.” I’m not sure if you’re seeing it yet but in case you aren’t, let me connect the dots for you. First I need to share with you that the brain links similar ideas and things together and it does it instantaneously. So the impossibility of becoming rich was being equated to the chances of winning the lottery or becoming taller. When we haven’t defined what rich means, it could simply mean the accumulation of wealth beyond where we are now or what we have experienced before. In essence it’s unfamiliar. Most people think that if they just simply take action that wealth and money will be created, but if you don’t believe it’s possible, then most likely money won’t show up. 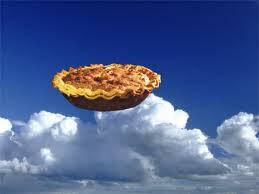 For him, as he put it, it was a “pie in the sky fantasy.” Well if you keep it in the category of “fantasy”, then how can it ever become reality? I then walked Curt through a process where he could gradually start to transform his thoughts around money. As you read through these, please know that we didn’t just jump from one to the next. It took him a little bit of time to absorb each one, saying them out loud a few times, and allowing himself to accept each one as a new potential truth for himself. As he processed these new ideas and concepts for himself, I could feel his energy increasing, and there was a new present enthusiasm in his voice. 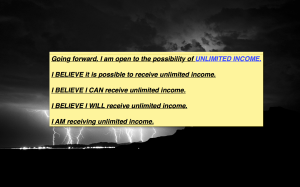 He was actually starting to see for himself that the actions he was taking in addition to believing he could have unlimited income created a new awareness of how he is already on his way. I suggested that he write out or type these statements and put them in a place where he could read them every day. He will then provide himself with a tool where he can support himself in really embodying them as his new truth. The image below is what he did, He created a sticky on his computer and put it on his screen so he would look at it every time he worked on his computer. What messages did you hear about money and wealth growing up? How might any of those messages be affecting you today? Money talks, not just in terms of influence and how it affects others, but also the influence it has on you. So why not have it say something to you that is in alignment with the kind of income you want to create for yourself – now.